Something's wrong with Baby Jessie! 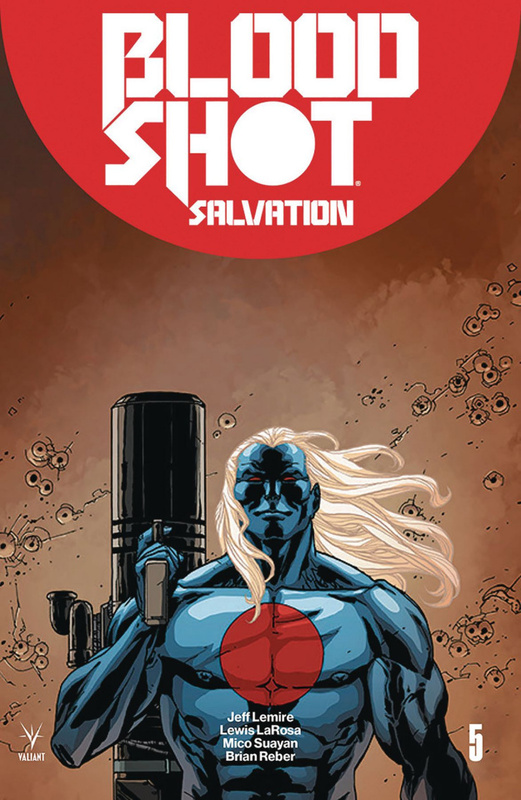 NOW: As nanites overwrite her biology, Bloodshot's newborn daughter is about to take a turn for the worse...just as her father is forced to confront the truth about a deranged cultist with a dark connection to their own family. THEN: In the near future, as Rampage's nationwide campaign of terror escalates, Magic's search for salvation points her farther away than she ever could have imagined... To the year 4001 A.D.! "THE BOOK OF REVENGE" shall bind them both as New York Times best-selling writer Jeff Lemire (BLOODSHOT REBORN, Black Hammer) and superstar artists Lewis LaRosa (BLOODSHOT REBORN) and Mico Suayan (BLOODSHOT REBORN) rush toward an inescapable turning point in Bloodshot's legacy of violence!